Edenton keeps a fairly low profile as far as a traditional nightlife scene goes. Live music happens occasionally, bar hopping isn’t an activity, and the idea of clubbing feels almost foreign. Here the evenings are fairly low key with a touch of Edenton sophistication to them. People often dine in the restaurants downtown and on the water, they may catch movies at the theater, go to show openings at the art gallery or check out special events when anything novel is happening. And on Wednesdays and Saturdays, they go to the Edenton Bay Trading Company. Malcolm and Debbie King own and operate Edenton Bay Trading Company, a specialty market for beer and wine located in the heart of downtown on S. Broad Street. They carry craft beers and fine wines from all over, ranging from North Carolina to the far-reaching corners of the world. But they’re more than just a shop – they’re an entertainment destination too. The venue hosts regular evening entertainment multiple times during the week and occasional pop-up events throughout the year, making their business stand out from your typical beverage retailer. When you visit their shop during their day, you’ll be amazed by their impressive offerings. Their wine offering includes Champagnes, port, sparkling wines, reds, whites and rosés. For beer, you can choose a cold drink from their cooler to enjoy in the Edenton Bay Trading Company’s courtyard or to take home. If you want to sample a variety, build your own six pack. And if you’re really passionate about good beer, they even do a Beer of the Month Club and offer those hard-to-find drinks from small-batch brewers. Sometimes, not always, the shop also carries a selection of artisanal cheeses and other accoutrements to pair with your beverages. The variety is small, but it is handpicked and changes from time to time, so you know what you’re getting is top-quality. Beer, wine and cheese – those are definitely the makings for any good night, and Edenton Bay Trading Company takes it a step further with their weekly Trivia Nights and Vinyl Nights. Round up your crew and head to the shop for Trivia Night, held each Wednesday evening from 7 to 8:30 p.m. The sessions are led by Patrick Sellers, and all topics are on the table. Test your knowledge for sports, pop culture, history, current events, film and more. Take advantage of the store while you’re there by cracking open a cold one or sipping on a glass of wine during the evening. You can bring your own snacks or dinner to have during the evening, or another option is walking to the nearby restaurants afterwards. 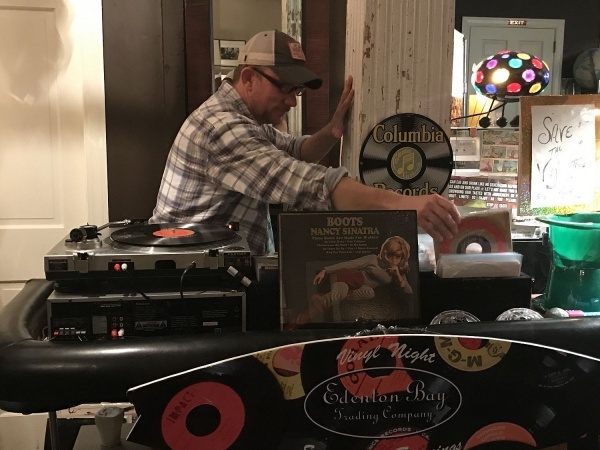 Saturday brings sangria and Vinyl Night to Edenton Bay Trading Company. This event is an awesome time for all music lovers, particularly those of the classic tunes and artists. DJ Eddie and Melissa Too host the evening, spinning an array of vinyl albums from 7 to 11 p.m. As Malcolm describes it, “It’s more than just people standing around playing music. It’s also a bit of a show – you just have to be there to experience it.” Sometimes vinyl albums will even be available for purchase. Like Trivia Night, you can kick back with a beer or wine from the shop as you also listen to the music. Sangria is also available on special every Saturday, made from Debbie King’s own secret recipe. Most of Edenton Bay Trading Company’s events are held in their courtyard, weather permitting. It’s a great gathering spot in the warm and cooler months, thanks to its multiple propane heaters and fire pits. When you’re ready to really shake things up, ask about their Edenton Escape Room in the floor above the shop. 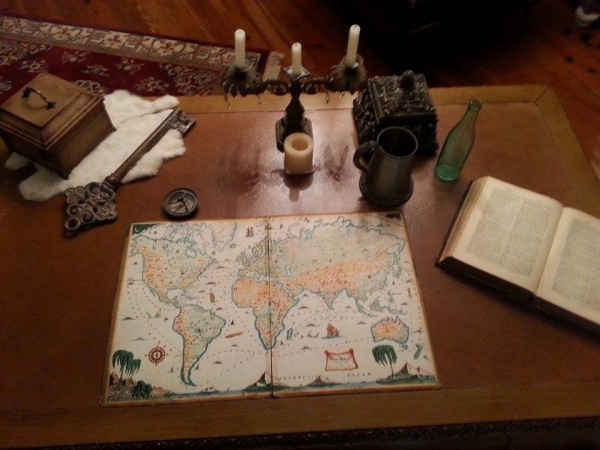 This escape room is offered by appointment only and is an exciting activity for birthdays, youth groups and office bonding sessions as groups of no more than eight people solve the mystery that awaits them in a captain’s quarters-style setting. The next time you’re wondering how to spend your evening in Edenton, see what’s going on at Edenton Bay Trading Company, try a new beverage and hang out in their elegant yet funky setting.